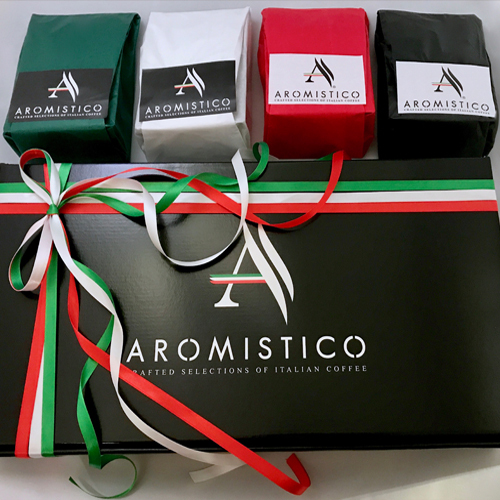 AROMISTICO, Gourmet Coffee and Gift Sets. Light, Medium, Dark Roast Coffee and Swiss Water Decaf. For all coffee makers. 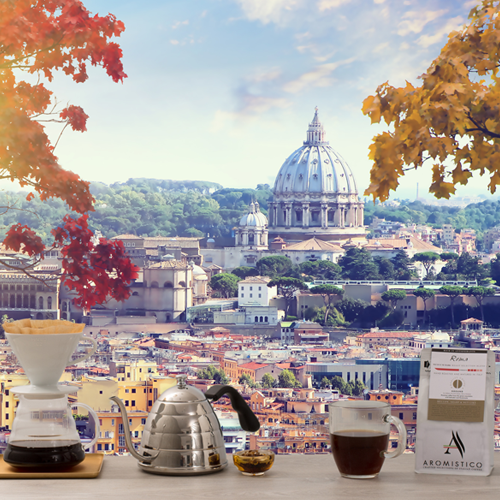 The best varieties of coffees from around the world, selected with a devotion for traditions, to create unique and unmistakable Italian gourmet blends, full of aroma and with a signature aftertaste. We are an independent Italian family business with an original and true artisan passion for quality coffee. Distinguished coffee flavour is not only determined by the origin of the beans and their roast type, but also by surrounding elements like air, temperature, climate and water. 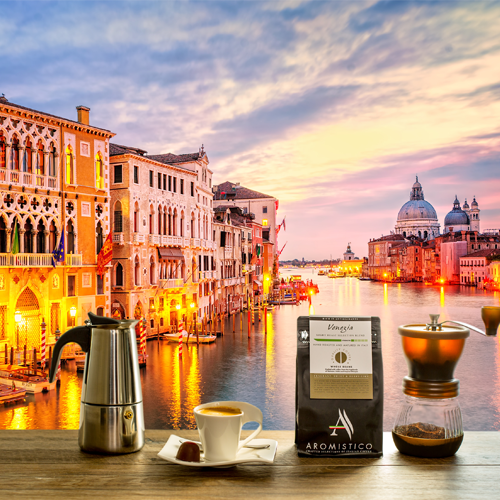 All our coffee is hand-roasted in Italy in small batches and perfected in the Italian air of the Lake Garda region. This blend has a fragrant aroma, an intense crema and delightful tones of honey. It is a blonde roast coffee with sweet berry-like taste. Crafted with coffee from the Highlands of Vietnam, India and tropical Ethiopia. The beauty of Venice and the sweets of an Italian 'Pasticcerias' were the inspiration behind this slow hand roasted coffee. This rich arabica hand-roasted coffee has a hint of hazelnut, a full body and an intense colour. It gives a dense flavour while at the same time releases a sharpness, so that taste and fragrance persist. A blend of premium coffees from the green mountains of El Salvador and Guatemala. You will be transported to a Roman piazza and immerse yourself in living "La Dolce Vita". This full-bodied coffee has a richly intense toasted flavour. It has a long lasting aftertaste and releases notes of malt and dark chocolate. A rich blend of coffee from the Brazilian coast of Santos, finest Kaapi Royale of India and from the mountains of Central Africa. 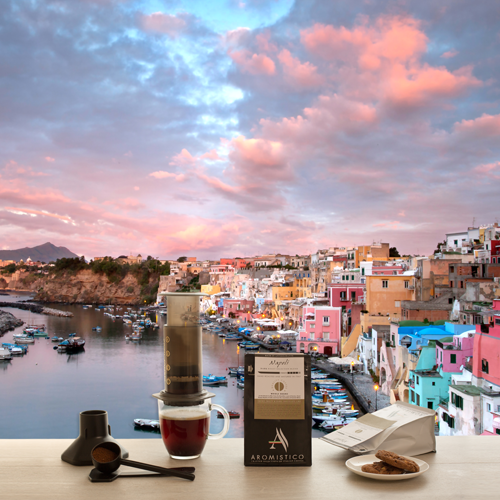 Imagine sitting by the Neapolitan seaside sipping this coffee under the Italian sunshine. Naturally decaffeinated with water and steam, no dissolvents/chemicals. The well-rounded aroma of this decaf offers a caffeine free experience. Crafted with decaf arabica from the rainforest valleys of Honduras and Central America, and witg beans grown in the altitudes of Vietnam. It will take you to a terrazza overlooking the skyline of Florence, as the sun sets behind its historical rooftops and chapels. 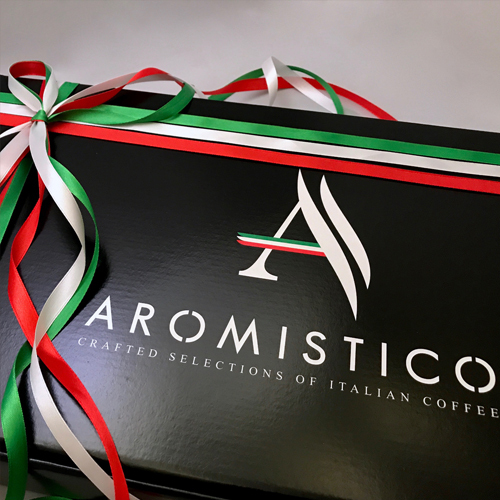 Full selection of our gourmet coffees in a stunning gift set. Each individual bag is beautifully wrapped by hand in colored paper. The gift box is tied with satin ribbons. Perfect for coffee lovers. Also available in "Classic" version. Using carefully balanced and crafted combinations of quality arabica and robusta, we have developed distinct Italian blends all different in strength and with distinguishing flavour notes. 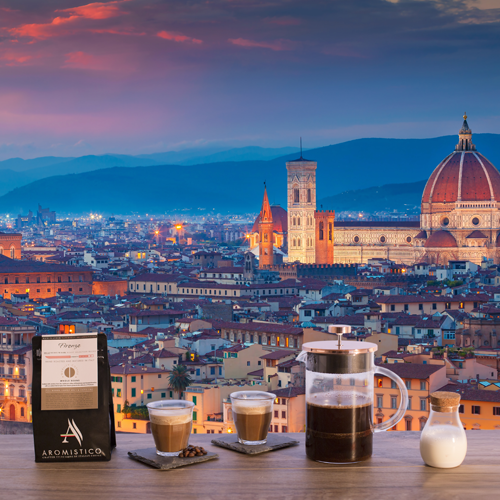 From Venice to Naples our gift set offer a full Italian coffee experience. A flavorsome COLD BREW blend, that releases irresistible milk chocolate richness. Drink ice-cold, as we transport you to the blue waters of an Italian beachside. For cold brewing. Also suitable for other makers. Crafted with selected coffee harvested in the green valleys of Ethiopia and Guatemala, combined with premium beans farmed on the sun-kissed coast of Brazil. In the 15th century, the vibrant trade in the Republic of Venice brought a large variety of African goods, including coffee, for the first time to its leading European port. Venetian merchants introduced coffee-drinking to the wealthy in Venice, charging them top prices for the luxury beverage. In this way, coffee was introduced to Europe. The first European coffee house was opened in Venice in 1645. 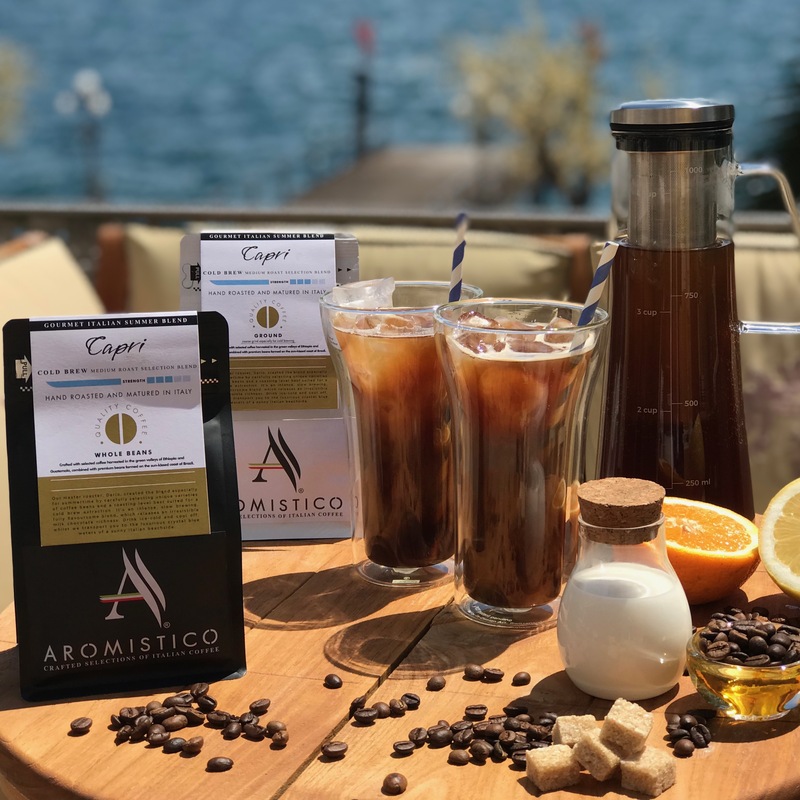 Using carefully balanced and crafted combinations of quality arabica and robusta, mostly from East Africa and Central America, with Aromistico we have developed distinct Italian blends all different in strength and with distinguishing notes, but with a reoccurring aftertaste theme. We hand roast each blend in our small roastery located in the beautiful region of Lake Garda, Italy. Aromistico has pronounced respect for traditions. Our in house coffee roaster has been used for over 40 years and it even once used to operate by wood burning. 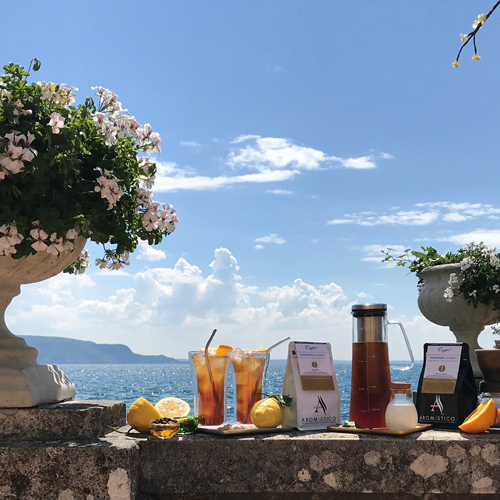 Starting from our Venezia Selection Blend, each of the Aromistico blends has been inspired by an Italian city and we carefully crafted each flavour, so that at every sip will transport you to one of these beautiful cities. 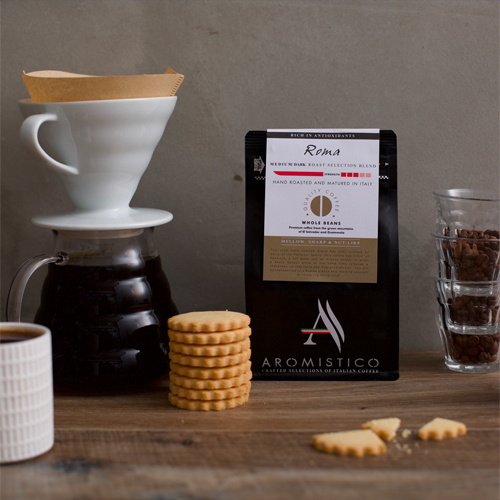 Aromistico is available as Whole Beans, so that you can ground and prepare the coffee just the way you like it, or already Ground for Cafetière French Press, Filter, Pour-over Drip, Italian Moka, Aeropress, Percolator or Chemex. All blends are suitable for Italian espresso: we reccomend ordering whole beans and griding on "very fine" settings. 5) Another firm stir, experience the aroma, plunge slowly and ENJOY! Coffee is technically FRUIT: coffee beans are not beans, they are fruit pips. Numerous research and studies suggest that Coffee, in a modern diet, is the biggest dietary source of disease-fighting antioxidants. A September 28, 2015 Harvard Gazette article highlighted numerous studies by Harvard T.H. Chan School of Public Health researchers that illustrate the positive effects of coffee. They suggest that coffee could reduce cavities, can boost athletic performance, improve moods, and stop headaches. It is also thought that it may also reduce the risk of type 2 diabetes, colon cancer, liver cancer, cirrhosis of the liver and Parkinson's diseases *. In a generic and industrial mass-production, when coffee pips are roasted, generally a lot of the natural properties are burned away. 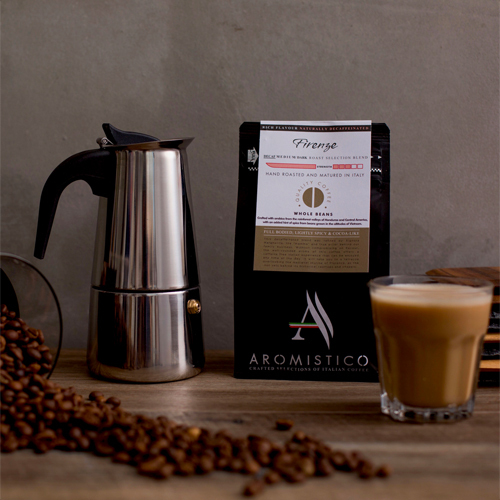 Aromistico is roasted following a process specially intended to preserve more of the natural antioxidants and properties of coffee beans. 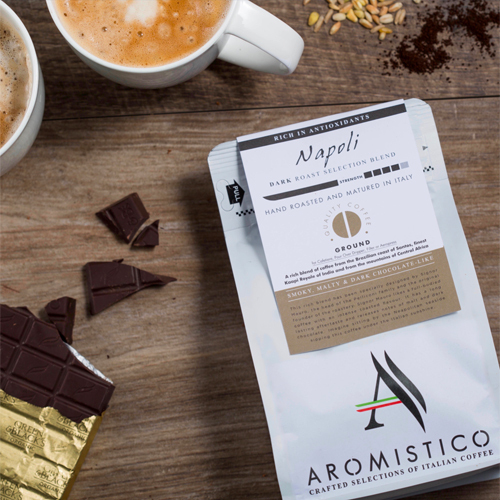 Independent chemical tests have shown that Aromistico can contain from 2 up to 3 times the level of antioxidants compared to a standard roast **. 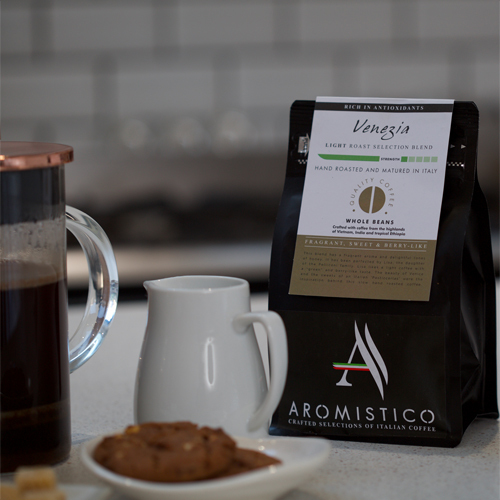 ** Up to 3 times more level of total chlorogenic acids (such as chlorogenic acid) when we compared Aromistico Venezia Blend with a generic roasted coffee. Signor Mauro grew up between the flavours and scents of the countryside in the Romagna region of Italy, where warm hospitality and genuine food are everyday rule. His parents owned a local grocery store and Mauro was helping out since he was little: here is where he began to develop his refined taste and sense of smell. In his late twenties he moved to Brescia in the north of Italy and opened a small coffee and grocery store of his own, called “Cento del Caffè”. Who knew that one day he would go onto roasting his own coffee. She met Signor Mauro in the 70s in the beach town of Rimini. Between sea, sun, and sand, much more than a summer love story was born. Signora Margherita used to be a primary school teacher and a school headmaster, but she soon decided to support her husband in his business pursuit. She is passionate and headstrong, but always available to offer an extra pair of hands. Not sure how she does it, but her advice and suggestions are always spot on. Let’s also not forget the help she constantly gives to the entire family at home: in total there are 5 nieces and nephews to tame. She is the first sibling in the family and following the footprints of her father, she was the one that took the first steps to move the family into coffee roasting. Pelliconi/Arca thereon expanded and renewed itself. With a deep business engagement, she spent years balancing work and raising her children. She built the foundation for the challenging obstacles that were faced by the business, when her brother also joined the company to move on with the further expansion of the family business. Dario injects vitality into the family business: when you meet him, from the offset you can feel his artisan passion and natural entrepreneurship. He actively participates in industry events and takes regular advance courses in quality coffee roasting. Together with Mauro and Lisa he crafts renowned specialty coffee blends. Just like his father, for Dario refined taste and acute sense of smell for genuine food are a way of life. We’d like to hear your comments about Aromistico. We are also interested in hearing from retailers and wholesalers. For any feedback or enquiry, please get in touch completing the form below.